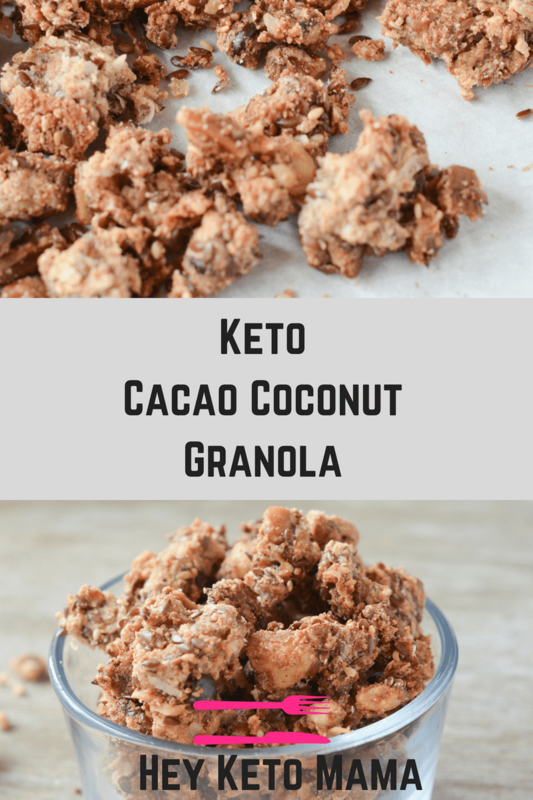 This Keto Cacao Coconut Granola is a delicious, low carb treat to satisfy your cravings for morning cereal, or just the perfect sweet and crunchy snack! Look what just came in the mail! 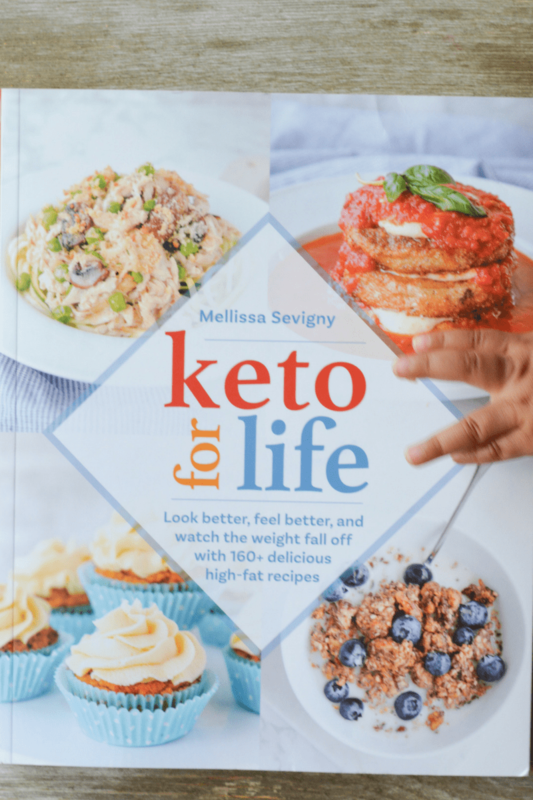 I am so excited about Keto for Life by one of my favorite food bloggers, Melissa Sevigny of I Breathe I’m Hungry. Even before I started my blog, way back when I was a keto newbie, Melissa’s blog was a huge inspiration to help me start my low carb lifestyle right. I’m so pumped to share a recipe with you! Keto for Life is full of over 160 delicious keto recipes to make your lifestyle easier and yummier! 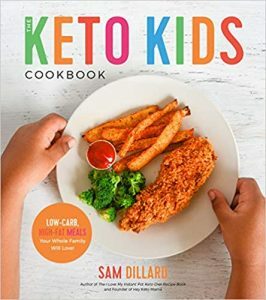 There’s also a TON of information, and helpful reminders on topics like Eating Out on Keto, Staying Keto while on Vacation, and Dealing with a Picky Family. Melissa writes in depth from her own personal experiences to help educate, encourage, and excite! 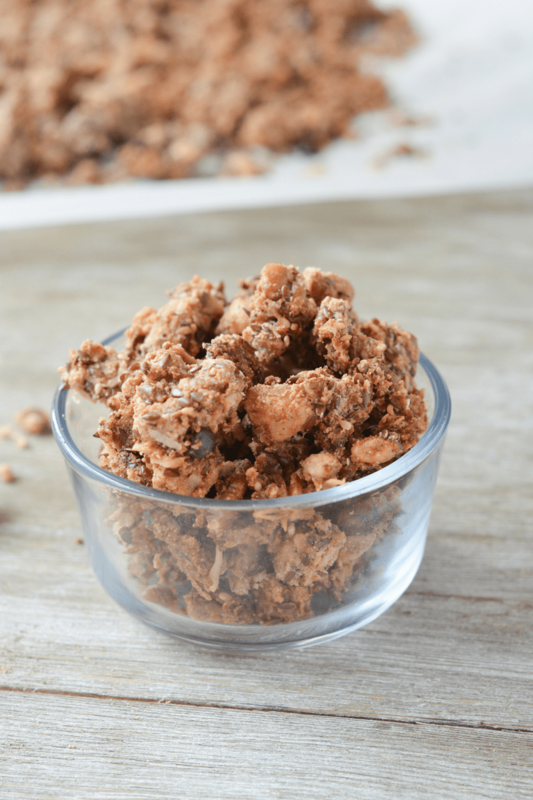 The recipe I’m sharing today is a super easy and delicious dish that’s great for a breakfast cereal or really an anytime snack. Granola has always been one of my favorite things to eat. I bet that’s the same for you because… who doesn’t love it? It’s the perfect morning, on-the-go, after school, or anytime snack. 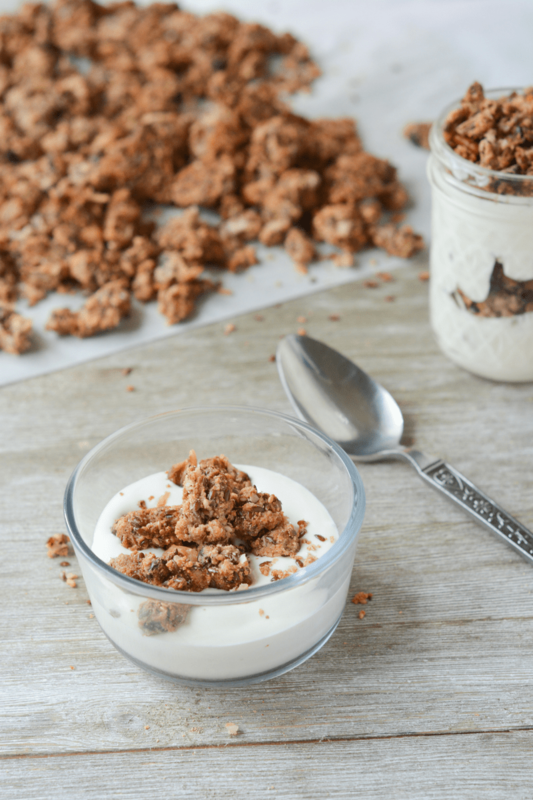 This granola recipe would be amazing in a bowl of almond milk with some fresh berries, but I wanted to try it out on my keto “yogurt” recipe. Let me just tell you…parfaits will never be the same. DELICIOUS. Preheat the oven to 300 degrees Fahrenheit. Line a 15 by 10-inch sheet pan with parchment paper. Place all of the ingredients in a large bowl. Stir well until the mixture is crumbly and holds together in small clumps. Spread out on the parchment-lined pan. Bake for 30 minutes or until golden brown and fragrant. Let the granola cool completely in the pan before removing. Store in an airtight container in the refrigerator for up to 2 weeks. Keep an eye on your granola. Every oven is different. Mine became golden brown and fragrant within about 15 minutes. Thanks so much for making and sharing this recipe with your tribe! So thrilled that you (and Maya!) are enjoying the book! ???????????? It’s my pleasure! Keto for Life is fabulous! I’m in love with Mellissa’s cookbook too! She’s so authentic and I drool over every thing she posts on her blog as well! 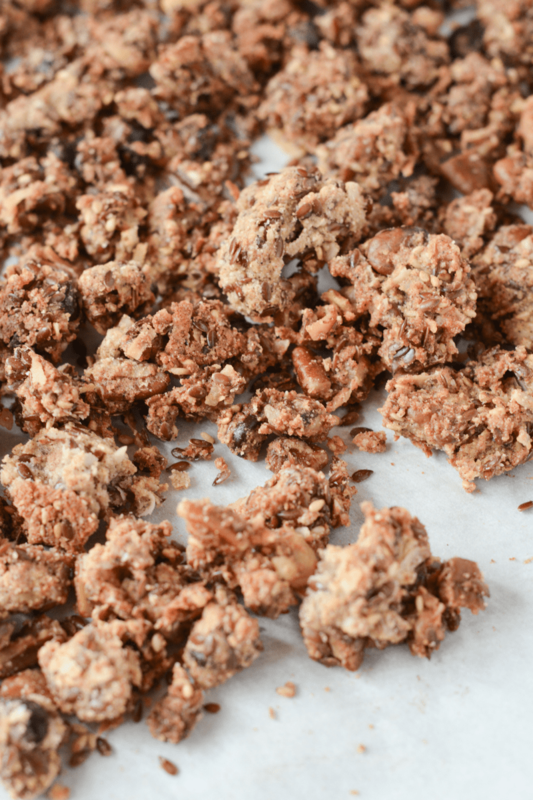 This granola is fabulous and great job on your pics too! I just shared her awesome Smoked Salmon Stacks that are to die for! Going to be difficult here! ???? could I miss out the protein powder and add vanilla extract instead? If so, how much? Also, because of a stomach problem, I can’t have ANY sweetener at all – even stevia or erythritol. Would adding vanilla extra make this sweet enough? Oh and is cacao powder ok to use instead of the nibs? I think that’s all! ???? The vanilla protein powder is in large part for keeping the clusters together so omitting the protein powder you would get loose pieces. So if you’re fine with that go ahead and just leave it out, it’ll still taste good! Vanilla extract doesn’t taste sweet to me so I don’t think it would add any sweetener if you’re omitting the erythritol but you can certainly try it if you’ve done it before and think it might work. 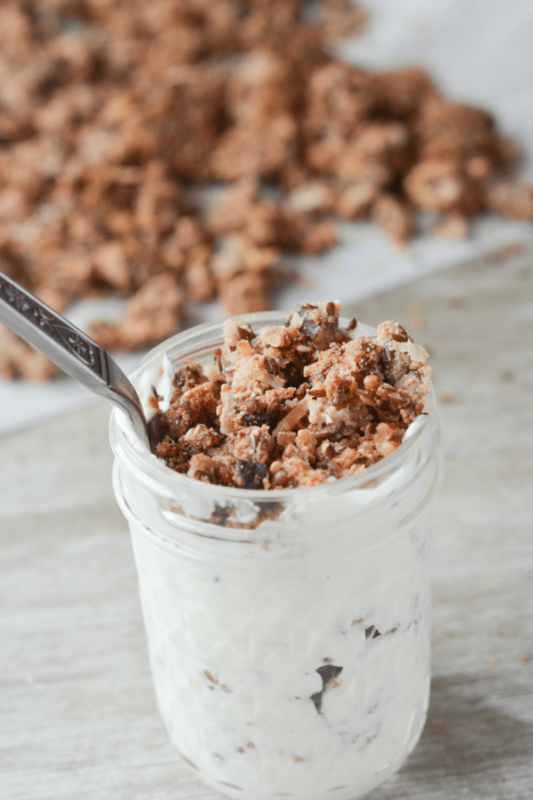 I love granola and can’t wait to try this! It sounds delicious. I think there might be a mistake with the number of servings since you say it serves 3 (making 3 cups) but then you show servings as 1/2 cup. I tried to figure out why the calories/carbs/net carbs/fats were coming out so different in a Keto app (over 900 calories per serving!) so I changed it to 6 servings instead of 3 and got your macros. Just an FYI. I haven’t tried it, but whenever I swap out coconut flour I use 1/3 as much as the recipe calls for almond flour. If you end up giving it a try, let me know how it turns out! I made this yummy granola this afternoon and am delighted with the results. I had to use what was in the pantry so i upped the pecans to 3/4 cup since I didn’t have any walnuts. I omitted the cacao nibs as well. It smells utterly divine and is very tasty. My pan was ready in 20 minutes. The part in middle of the pan is not as crispy as the edges, so i will pop that part in the toaster oven to crisp up as needed. I wonder, why do you think the instructions say to store this in the refrigerator? I will follow instructions. 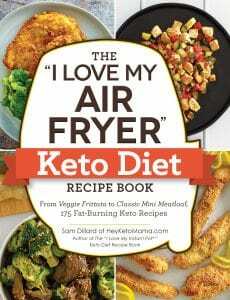 I have enjoyed the Keto for Life Cookbook and while I am not embracing the complete Keto eating plan, the reduction in carbs has been very beneficial. 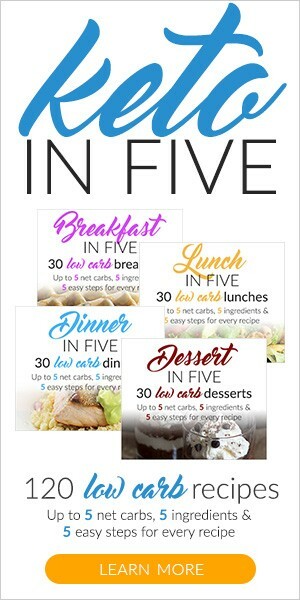 The recipes and eating plans are excellent resources.